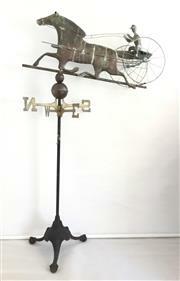 Antique copper horse carriage weather vane on cast iron stand, H 150 x L 85cm. Vintage Coca Cola clock face, c. 1930s, marked selected devices Co. Inc, New York, NY, W 36cm. 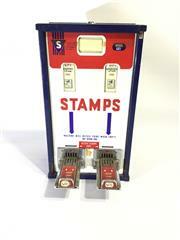 Vintage metal stamp vending machine, US version, W 36cm. Antique timber fishing lure display, H 27 x L 33cm. Vintage plastic barber service sign/display, H 56 x L 124cm. 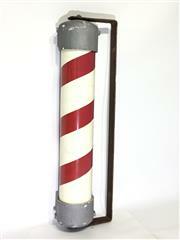 Vintage barber pole with metal bracket, H 56 x L 15cm. Vintage pair of Barsony Aboriginal bookends, marked to base Barsony, H 12cm. 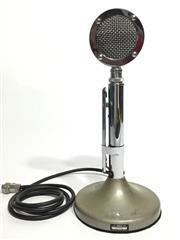 Vintage Astatic microphone, H 30cm. 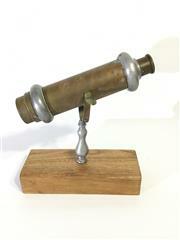 Vintage brass/copper kaleidoscope mounted on a timber base, H 28 x L 27cm. Vintage metal bird/chicken feeder, D 38cm. 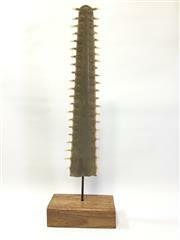 Antique mounted Sawfish bill mounted on timber display stand, H 60 x W 19cm. 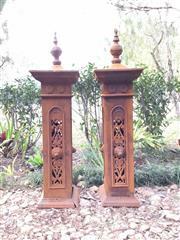 Pair of decorative cast iron gate posts, H 158cm. 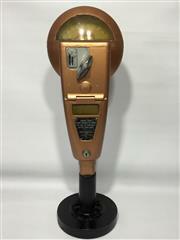 Vintage US parking meter mounted on metal base, H 60cm. 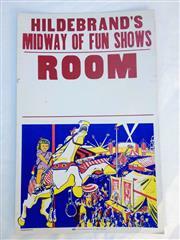 Vintage Hildebrands Midway of Fun Shows Room poster, c. 1960s, H 56 x W 36cm. 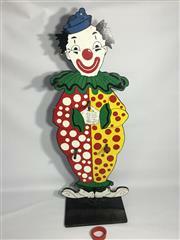 Vintage hand painted timber carnival ring toss to include five rings, H 95cm. 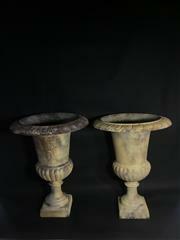 Pair of large white cast iron urns, H 62 x D 42cm. 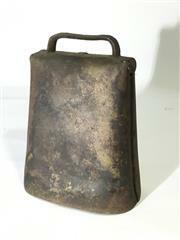 Vintage rustic metal cow bell, H 16cm including handle. Vintage Franzen Bros. 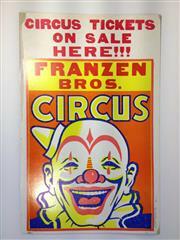 Circus poster c. 1960s, H 56 x W 36cm. 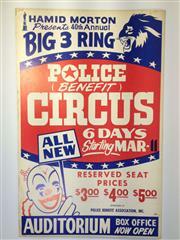 Vintage Big 3 Ring Police Benefit Circus poster c. 1970s, H 56 x W 36cm. Vintage Ringling Bros. and Barnum Bailey Circus poster in plastic wrapping, H 28 x W 107cm. Pair of cast iron copper coloured jardinieres/planters, H 14 x L 29cm. Large cast iron silver jardiniere/planter with succulent, planter H 25 x L 50cm. Vintage police car spot light, marked General Electric spot light, Chicago, USA, L 40cm including handle. Vintage exit sign/light in metal frame with glass lens c. 1940s, H 25 x L 34cm. Cast metal Shell Oil plaque, H 29cm. Pair of antique timber decoy ducks, H 20 x L 33cm. 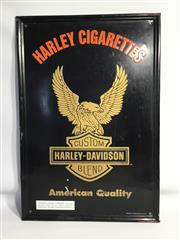 An embossed Harley-Davidson cigarette tin sign c. 1990s, H 65 x W 44cm. 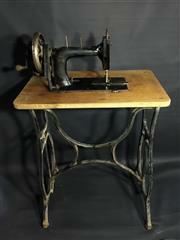 Vintage Wertheim Francfort hand crank sewing machine with cast iron base on wheels, H 96cm. A white cast iron jardiniere/planter with succulents, H 15 x L 59cm. Pair of large, white cast iron, oval shaped jardinieres, H 20 x L 46cm. 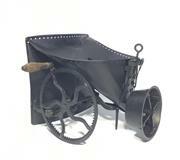 Antique metal seeder machine, H 27 x W 40cm. Pair of cast iron bird bath/planters, H 80 x D 40cm. 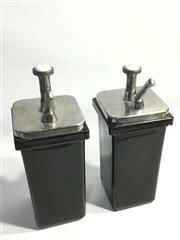 Vintage pair of ceramic soda fountain syrup dispensers, lemon and vanilla, H 36cm. 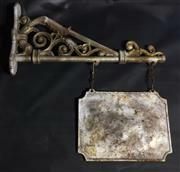 Antique brass shop door bell, H 18cm. 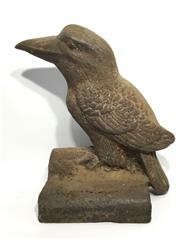 Vintage cast iron Australian Kookaburra doorstop, H 28 x W 26cm. A Suzuki GSXR Motorcycle light up sign, H 31 x W 86cm. A childrens carousel horse made from fibreglass with handle, H 71 x L 98cm. 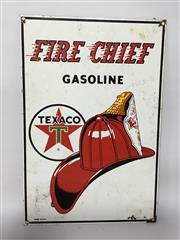 Enamel Fire Chief Gasoline Texaco sign, marked made in USA, H 41 x W 27cm. 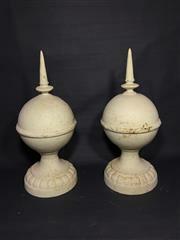 Pair of white cast iron finials/spires, H 50cm. 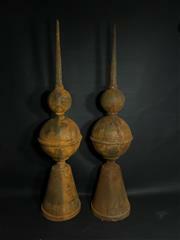 Pair of large cast iron finials/spires, H 92cm. 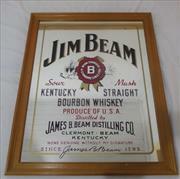 Jim Beam bar mirror, H 72 x W 57cm. Etched glass mirror depicting a sailing boat near an island palm tree, H 45 x W 91cm. Papua New Guinean wooden table of crocodile form, carved from a single piece of timber, H 33 x L 219 x W 48cm. A Papua New Guinean Sepik River wooden war shield, H 197 x W 48cm. Pair of rectangular white cast iron jardinieres/planters, H 20 x L 60cm. Double sided Yamaha Motorcycle light up perspex sign in metal frame, W 55cm including bracket. 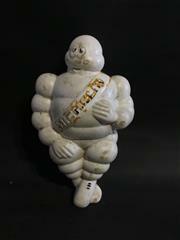 A plastic Michelin man figure with metal bracket, H 34 x W 19cm. Vintage metal school water bubbler with handle turns, H 21cm. Set of three rabbit traps, one marked Platypus, another Lanes Ace, L 25cm. 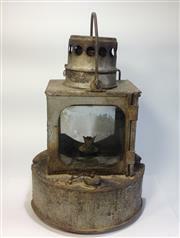 Antique dingo trap, L 57cm. Vintage inflatable Good Year blimp display, L 75cm. Vintage hand crafted WW2 naval trench art depicting a model ship in bottle, marked HMS Caesar, H 10 x L 27cm. 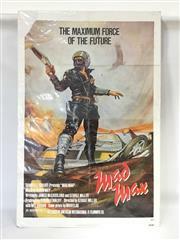 Original 1979 Mad Max movie poster with cardboard backing and plastic cover, #80029, H 104 x L 69cm. Vintage cross cut saw, L 170cm. An industrial cast iron leg table with hardwood timber slab top, H 87 x W 60 x L 218cm. 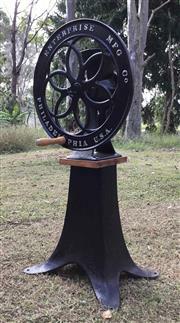 Antique cast iron enterprise coffee grinder on stand, H 109 x D 49cm. A Mickey Mouse telephone, H 37cm. Pair of large, oval cast iron planters painted copper, H 20 x L 46cm. 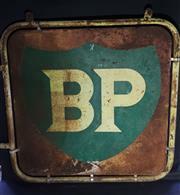 BP Petrol double sided sign with metal frame, W 132cm. Four vintage car hood/bonnet ornaments, two mounted on timber bases. A Papua New Guinean woven basket, H 30 x W 28cm. 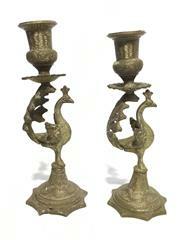 Pair of brass peacock candle holders, H 21cm. 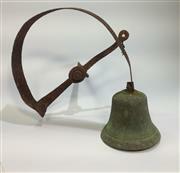 A large cast iron bell attached to a timber base frame, H 83 x L 74 x W 53cm. Vintage fibreglass marlin fish c. 1960s, L 210cm. 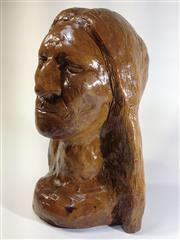 Clay sculpture of a female bust, signed K. Jones, H 22 x W 16cm. 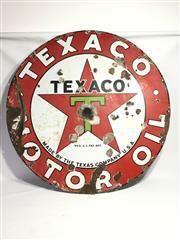 Vintage enamel Texaco sign, D 106cm. Cast iron post bell with bracket, H 82cm. 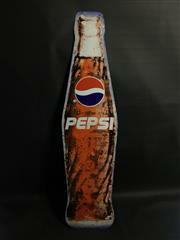 Pepsi bottle sign, H 122 x W 30cm. Pair of silver cast iron rectangle form planters, H 20 x L 34cm. An antique cast iron lion door stop, H 22 x L 27cm. A vintage painted steel No Parking Between Standards sign on heavy cast base, H 183 x W 38cm. A pair of cast iron jardiniere/planters with decorative base, planted with succulents, H 50cm including plant x W 37cm. A c. 1970s signed piece of copper wall art, H 30 x W 61cm. An industrial cast iron wheel, D 78cm. A cast iron shop sign with bracket, L 70cm. 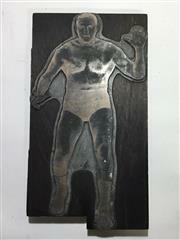 Vintage Australian wrestling image print block in metal and timber c. 1960s, H 24 x 13cm. Set of bar swizzle sticks with original packaging in frame c. 1950s, H 32 x W 36cm. Cast iron dog door stop/boot scraper, L 36cm. 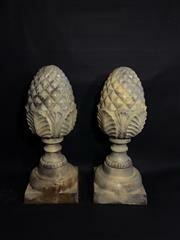 A pair of cast iron gate post entrance finials of artichoke form, H 52cm. A vintage E.R.C industrial double sided school clock with bracket. Pair of plaster building air vents depicting bird scenes, L 38cm. Vintage black cast iron boot scraper, W 28cm. 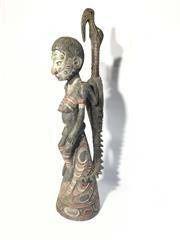 Papua New Guinean carved statue painted with natural pigments, H 74cm. 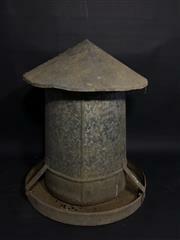 Vintage Willow galvanised water can, H 40cm. Caltex oil rack tin sign, L 53cm. Pair of black, oval form cast iron jardinieres/planters, H 14 x W 30cm. 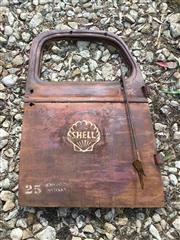 Vintage Chevrolet truck door with shell logo, H 123 x W 82cm. Set of three vintage butchers hooks, H 47cm. Vintage enamel street lamp, H 50 x D 49cm. Vintage Xanadu oil rack sign, H 41 x L 57cm. 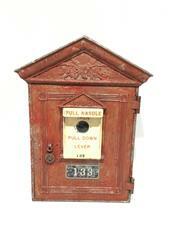 Vintage cast metal fire arm box, H 41cm. Car and hood ornament artwork on perspex, c. 1950s, H 90 x L 145cm. 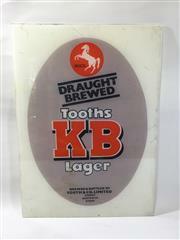 KB beer sign, H 57 x W 41cm. Cast iron bear door stop, H 17 x L 23cm. 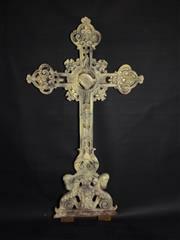 Small white cast iron crucifix, H 85 x W 47cm. 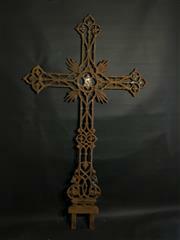 A large cast iron crucifix, H 129 x W 73cm. Pair of vintage chromed brass Optic Pearl bar shot pourers, made in England, L 16cm. Large silver cast iron planter, H 25 x W 50cm. Vintage Hamilton chain driven tractor pedal car, L 95cm. Please note this is a Timed online only sale, there will not be a viewing for this sale. The sale will end at 7pm on Wednesday the 19th of September, invoices will be sent out shortly thereafter. Items are offsite and will be delivered to our premises from interstate. Pickups available from Monday 24th September -Tuesday 25th September strictly from our rooms at 8-16 Moore St, Leichhardt, NSW.